American wars, Nepali bodies and the price of the war economy. Despite such coverage of the dangers and unintended costs of trafficking to conflict zones, the stream of labourers from poor countries towards America’s international wars has not slowed, and rarely have contracting companies, which hire workers on the governments’ behalf, been held responsible for the plight of these workers. How has this been allowed to continue despite the fact that this trafficking is largely funded by US tax payer dollars – through multiple layers of contracting and subcontracting – when there are laws and administrative structures designed to prevent such exploitation? The answer has partly to do with the pressures of poverty and unemployment in countries like Nepal. But it also has to do with the incredible success of contracting companies – who have profited greatly off the war economy – in using the American legal system to shield themselves from any accountability. 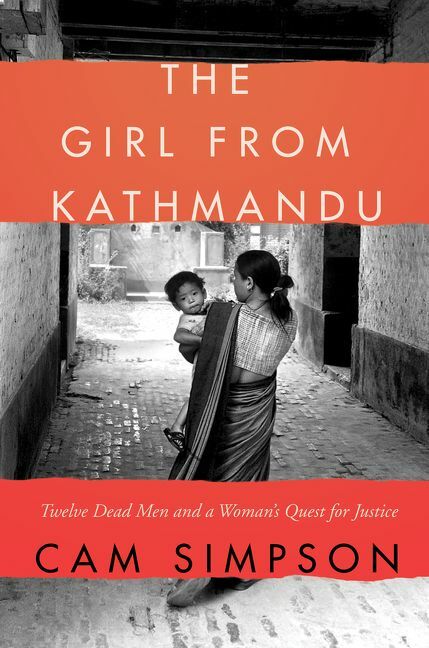 The Girl from Kathmandu is Cam Simpson’s heartbreaking tale of the search for justice that followed the kidnapping and eventual execution of twelve Nepalis in Iraq in 2004, who were being taken to work for KBR Inc., previously known as Kellog Brown & Root – the large contracting firm under the Texas-based parent company Halliburton which was responsible for much of the logistical support for the US military in Iraq. Simpson tracks the plight of Kamala Magar, the widow of Jeet Magar – one of the twelve Nepalis killed in 2004 – in an epic legal odyssey that takes her from her home in the mountains of Nepal to a courthouse in Houston. It provides the first book-length case study of how difficult it is to halt human trafficking and hold large corporations accountable for the treatment of their workers. ‘The Girl From Kathmandu’ by Cam Simpson. HarperCollins Publishers, 2018, 400 pp, USD 27.99. Jeet and eleven other Nepalis are brought to Jordan through a network of traffickers. Here, they are housed in a grim compound, before being taken into Iraq by a Jordanian manpower agency, named Daoud and Partners, which subcontracted from the KBR. On the road, Jeet and his companions are kidnapped and eventually killed, their deaths captured in one of the first execution videos circulated on the internet. The book’s focus then shifts to the work of a team of lawyers in the US, at Cohen Milstein (previously called Cohen Milstein Sellers & Toll), who find the families of the victims and then file a series of lawsuits on their behalf. The tenacity of these lawyers is remarkable and much of the book centers on the various trials, detailing the legal tactics used by the KBR to stall the case, attack Kamala Magar’s attorneys, and discourage those looking for some form of justice (though the legal material in the latter half of the book drags somewhat). Simpson catalogues the nefarious work of the KBR – he compares one of their lawyers to a Bond villain – and the involvement of thousands of other actors in the global supply chain of migrant labour who are complicit in exploitation, both minor and severe, or are simply willing to turn a blind eye to injustice. It is not much of a spoiler to say that while Magar receives some monetary compensation for the death of her husband, KBR manages to escape most of the serious allegations of human-rights abuses despite an overwhelming amount of evidence. At the same time, the book makes one take a closer look at the drivers of migration of workers towards conflict zones, forcing readers to contemplate the wider repercussions of America’s recent wars. Instead, trafficking relies on networks of relationships. Jeet Magar relied on a broker in Nepal, who was in contact with a labour firm in Jordan that subcontracted to the KBR. But even this linkage is complicated by legal obfuscation: Simpson struggles to locate the Jordanian firm despite the fact that it has received hundreds of millions of dollars in US contracts. Ultimately, while each individual can view part of the chain, no one really sees the process from start to finish. The limited success that Magar and other litigants have had in winning legal battles underscores just how difficult it is to regulate the flow of international workers to conflict zones, or even understand the scope of it. During the various cases, the KBR long held that Jeet and his companions did not actually work for them; they denied any relationship with the subcontracting firm. Once this was shown to be untrue, they continued to build a defence based on the notion that they should not be held responsible for the actions of those they subcontracted to. Later, they convinced the US District Court in Houston that since the victims were not Americans and the crimes did not take place in the US, the fact that US government dollars ultimately funded the death of these workers should not matter. In effect, the court decided that actions caused by US government spending do not necessarily come under US jurisdiction when they occur outside the country. More problematically, subcontractors are rarely monitored by governments, even when they are supplying contracts to companies complicit in human-rights abuses. Private security firms in conflict zones have largely convinced the US and other Western governments that they should be self-regulating. The only serious international agreement around such migration, the Montreux Document – signed by 54 countries so far, along with the European Union (EU) and the North Atlantic Treaty Organization (NATO) – recommends that companies follow a set of guidelines in regulating the movement of workers on security contracts. But the agreement is neither binding nor provides any means of enforcement. The US has in its books the Defense Base Act, which dictates that those working for firms receiving US government funds should be compensated in case of injury or death. But the execution of the law relies on companies such as the KBR self-reporting these injuries, which is rarely in the company’s best interest. Even when there are legal attempts to bring such contracting companies to task, they are willing to spend significantly in legal costs, to ensure that such cases do not make progress within the US legal system. While contracting companies working for the US government have been held accountable on multiple occasions for financial malfeasance and shady accounting – there is a special US auditor to oversee American projects in Afghanistan – significantly fewer cases have been successful in holding them accountable for human-rights violations. The sad implication is that public interest in America’s recent wars in Afghanistan, Iraq and elsewhere only peaks when US soldiers are killed or when the wars cost taxpayers additional dollars. This is not a purely American phenomenon; the Canadian government recently denied compensation for 13 Nepalis who were killed while working at their embassy in Kabul. In response, five Nepali survivors of the attack have sued the Canadian government and Sabre International, the security firm that hired them, seeking insurance benefit outlined in their original contracts. Still, when the casualties are from economically weak countries, few seem to care. While Simpson draws on Kamala Magar’s story to illustrate the horrors of the war economy, he pays less attention to what continues to draw workers like her husband to war zones from countries like Nepal. An economy with few opportunities and high levels of inequality contribute to the continued flow of workers from Nepal. The legacy of British Gurkha recruitment – a sense that war is one of the few places where a young man can get ahead in life – further reinforces the stories of generations of Nepalis soldiering abroad. It might be risky, many of the contractors I interviewed told me, but the payout was worth the risk. Unfortunately, this was rarely the case: multiple brokers took a cut from each contract, about which the workers would often be lied to. Workers would eventually have to settle for contracts much lower than the ones they were promised initially, and their families would take out loans and be crushed by the interest they owed. Several workers I spoke to told me how they had been promised salaries of USD 1000 a month, only to show up on a US military base and be told their salary was USD 400. If they did not like it, they were told they could leave – quite impossible since this would mean walking out the front door of a military base into a war in a country where they had no contacts and did not speak the language of. Most of those contractors who had worked in Afghanistan or Iraq that I spoke with were looking to move on to another war zone since they had not earned as much as they had hoped. Many of the workers who were not killed or grievously injured still ended up suffering hardships for slight financial gain. Furthermore, the fact that Nepali labour is much cheaper also meant that contracting companies undervalue their safety: the weapons and equipment they receive is often in bad shape. 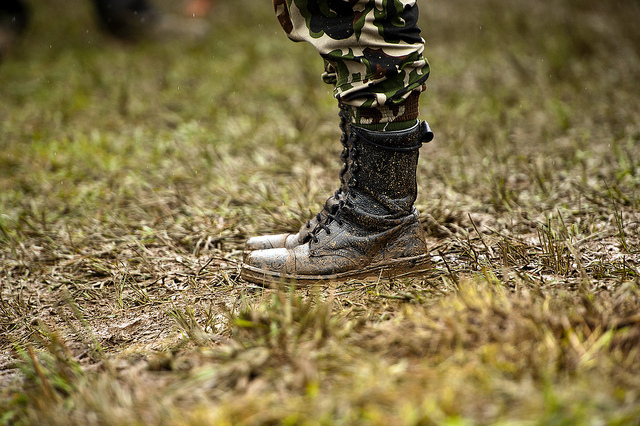 Western contractors are given personal weapons, whereas Nepalis are forced to share. And when Nepalis are attacked by insurgents, support for their convoys is often times too little and too late. This is where readers from countries with troops in Afghanistan, Iraq and elsewhere should feel most uncomfortable. The broker cannot claim to be blameless, since they facilitated the trafficking. KBR executives cannot claim to be blameless, since they created the labour demand and allowed brokers to fill it. And, finally, Western taxpayers should not claim to be blameless either, since the entire contracting system is designed to ensure that inexpensive labour replaces Western soldiers. Ultimately, countries like the US that are involved in conflicts replace their soldiers with Nepali bodies to protect their government from the blowback from soldier causalities. Since the end of the period that Simpson is focusing on, the problems he describes have become more complicated. There might be fewer contractors in Iraq and Afghanistan, but they make up an even higher percentage of America’s military presence in Afghanistan, currently around 75 percent. There is also talk in the Trump administration of shifting to a purely contracted approach to the conflict. Erik Prince, former head of Blackwater – the security contracting firm notorious for killing several civilians in Iraq – and brother of Secretary of Education Betsy Devos, has pushed a proposal that would replace all US soldiers with private security contractors. In the meantime, the fifty thousand or so Nepalis who have worked for US contracts in Iraq and Afghanistan have not all returned home. Some have moved on to other, messier war zones, further from the public eye – Syria, the Central African Republic, Yemen and Russia – where they work for companies that are less regulated and more likely to resemble militias. Despite the partial success of Kamala Magar and those like her in cases of contractor abuse in the early 2000s, there has been an unintended consequence that doesn’t help the workers’ cause. By the time the US military surged troops (and with them, over a hundred thousand contractors) into Afghanistan, large contracting firms had learned their lessons: bad press about human-rights abuses was bad for business. This did not improve conditions for workers, as much as it pushed companies to make sure they were not held responsible for them. Thus, over the past ten years, a series of smaller Nepali, Afghan and Indian recruiting firms began to take over the process of recruitment. Large companies like the KBR would then hire workers directly in conflict zones, not asking how they got there, paying these smaller companies to traffic labourers for them. The Girl from Kathmandu provides a snapshot of some of the abuses in the early years of the US war in Iraq and the attempts to find justice for its victims. Simpson’s account helps better understand the tragic consequences of such unregulated contracting and the costs of outsourcing war. And while the book focuses on a particular period of that global labour movement, young workers from poor countries continue to move to war zones, lured by the promise of wealth, but unprepared for the abuses that may await them. ~Noah Coburn is an anthropologist at Bennington College and author of Under Contract: The Invisible Workers of American Global Wars, which tracks the fates of workers from seven countries to conflict zones. He has a PhD in anthropology from Boston University and has been conducting research in Afghanistan since 2005. His previous work includes Bazaar Politics: Power and Pottery in an Afghan Market Town and Losing Afghanistan: An Obituary for the Intervention. He can be reached on Twitter @NoahSCoburn. Cosmopolitanism as an antidote to the island's nationalist history. On the life and times of Qandeel Baloch, Pakistan’s first social-media celebrity.